We’ve now had just over 3 weeks of kindergarten, which means three weeks of the boys being in different classrooms. You’ll remember being split-up was not our desire or plan for the boys, but things out of our control went down 2 days before the start of school, and they ended up in three different classes. A lot of people have been asking me how things are going with that, and in general, they’re going well! We’ve only had a handful of instances (so far) of one kid being bummed that his teacher isn’t doing something the same exact way the other two kindergarten teachers are. One of those times it caused tears and the claim that his teacher is only interested in giving out more homework. Bahaha! The irony there is that kid actually came home with less homework last week than his brothers! The boys enjoy having recess together, and have become pro-active when it comes to sitting together at lunch. They quickly noticed that the lunch aids are always changing, and didn’t always know to ask them if they wanted to sit together, so Jackson, Ty & Chase started speaking up! Ty is the one that verbalizes most often that he misses being with his brothers, but he’s doing well hanging in there. 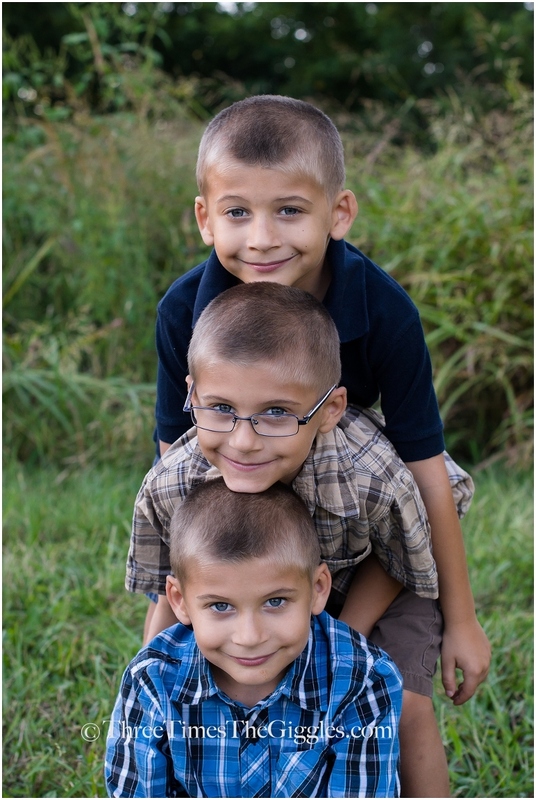 The boys requested a “head stack” picture. I had no idea what they meant, until they put themselves in this formation. Cracked Nick and me up! All three of them are doing really, really well academically! All of the kindergartners have completed base-line testing recently, and Jackson, Ty and Chase scored exceptionally well. So well that Chase’s teacher called me a week ago to discuss sending him to first grade for some reading time, and threw out the possibility of testing him for the gifted program (but that wouldn’t happen until closer to December). On Friday morning I chatted on the phone with the School Improvement Specialist. She’s the one that administered the reading tests to the boys, and after telling me how wonderful and sweet my guys are, she told me they’re also very smart. Jackson tested at a 2nd grade reading level, and a 3rd grade instructional level. She explained that basically means that he already knows 90% of the 2nd grade words, and would fit in with a 3rd grade reading class, because with a little help from her, he was able to sound out most of the words. Ty & Chase both tested at 1st grade reading levels and 2nd grade instructional levels. Smart cookies we’ve got here! So the solution? The three of them are going to spend an hour each day in 1st grade for “enrichment”. The best part? They get to go to the same class, at the same time of day! YAY!!! She said, “I know you guys wanted them together and that didn’t happen, so would you be interested in them doing the 1st Grade enrichment together?”. Friday afternoon I told the boys I’d talked to the school, heard how they did on their reading testing, and that all three of them were going to get to go to 1st Grade for an hour each day. They thought that was pretty cool. Then I told them which 1st Grade teacher they’d be with, and that made them excited (Jackson’s been to her class a few times already and liked her)! THEN, I told them they’d get to go at the same time and they went nuts! So there we have it – the boys’ smarts + finally some understanding from the school folks = more time together for the boys at school! I’m so glad your little guys are doing so well in their new arrangement. I am so sorry that they couldn’t be placed together. My state is on of 12 states with laws protecting the parents of multiples. We get to choose either way, and I chose (with the same research as you) to keep mine together for kinder this year.